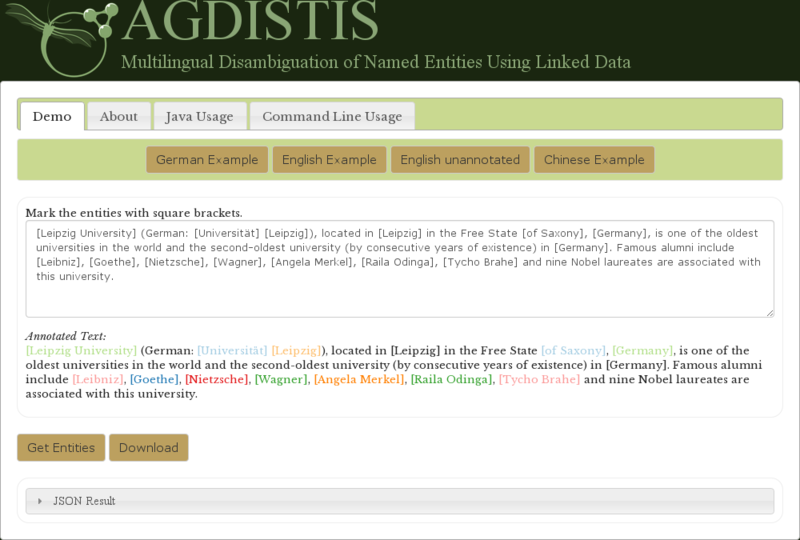 AGDISTIS is an Open Source Named Entity Disambiguation Framework able to link entities against every Linked Data Knowledge Base. The ongoing transition from the current Web of unstructured data to the Data Web yet requires scalable and accurate approaches for the extraction of structured data in RDF (Resource Description Framework). One of the key steps towards extracting RDF from natural-language corpora is the disambiguation of named entities. AGDISTIS combines the HITS algorithm with label expansion strategies and string similarity measures. Based on this combination, it can efficiently detect the correct URIs for a given set of named entities within an input text. Furthermore, AGDISTIS is agnostic of the underlying knowledge base. 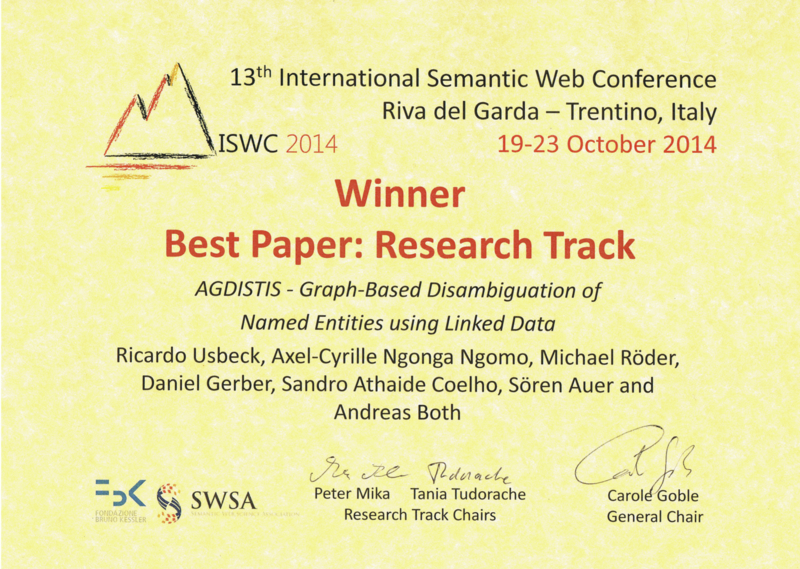 AGDISTIS has been evaluated on different datasets against state-of-the-art named entity disambiguation frameworks. Moreover, FOX is a modern Named Entity Recognition Framework which uses AGDISTIS for the Named Entity Linking Part. Additionally, FOX is used by DEER to extract named entities from resource descriptions. Visit our wiki for more up-to-date information! Short Description of AGDISTIS - Framework can be found here. More evaluation of AGDISTIS can be found here. For more information please visit our project site at Github. This steady growth is amazing! Thank you all! Here is the video from the closing ceremony. 21.10.2014 - We present the AGDISTIS demo at Stand 79 at ISWC 2014. Visit us! Discuss with us! 16.09.2014 - Short news: the English version of AGDISTIS has been called 63664 times since deployment in October 2013. Sofar the German and the Chinese endpoint of AGDISTIS have been called 301 respectively 168 times since July 2014. 15.09.2014 - New version released! AGDISTIS is now more efficient, faster and especially easier to configure.